After lunch at the world's busiest McDonald's, we made our way to the Rock. Partially covered in scaffolding, but hey, we're used to that by now. Looking down into town as we made our way up the hill. Rising high above the fertile plain of Tipperary, the Rock of Cashel is one of Ireland's most historic and evocative sights. Seat of the ancient kings of Munster, this is where St. Patrick baptized King Aengus in about A.D. 450. Strategically located and perfect for fortification, the Rock was fought over by local clans for hundreds of years. Finally, in 1101, clever Murtagh O'Brien gave the Rock to the Church. His seemingly benevolent donation increased his influence with the church while preventing his rivals, the powerful McCarthy clan, from regaining possession of the Rock. As Cashel evolved into an ecclesiastical center, Iron Age ring forts and thatch dwellings gave way to the majestic stone church buildings enjoyed by visitors today. Queen Elizabeth II's history-making visit to Ireland in 2011 included a visit here. On this 200 foot high outcrop of limestone, the first building we encountered was the 15th century Hall of the Vicars Choral, which housed the ticket desk and the intact former dormitory. This is the youngest building on the Rock, dating from the early 1400s. It was home to minor clerics and vicars who lived quite comfortably here with a large fireplace and white, lime-washed walls. Passing through the Vicars dormitory, we got our first full glimpse of the Cathedral. Looking back at the Hall of Vicars Choral. Birds were making their nests all up in these holes. We ventured into Cormac's Chapel. As the wild Celtic Christian church was reined in and reorganized by Rome 850 years ago, new architectural influences from continental Europe began to emerge on the remote Irish landscape. This small chapel is Ireland's first and finest Romanesque church. It was consecrated by King Cormac MacCarthy in 1134. Tradition says that the chapel's sandstone was quarried 12 miles away and the blocks were passed from hand to hand back to the Rock. But, it's unlikely they had the manpower to form a conga line that long. This small group was admiring the empty stone sarcophagus in the interior of the chapel. No one knows for sure whose body once lay there. Back outside. Man, is that Ireland or what! Just what I pictured. Looking out toward Hore Abbey through the defensive walls surrounding the Rock. A better shot of Hore Abbey, named for the Christian monks who wore simple grey robes, roughly the same color as hoar-frost. Down by the wall looking up to the Cathedral. Lovely views over the Plain of Tipperary. Called the "Golden Vale," its rich soil makes it Ireland's most prosperous farmland. In St. Patrick's time it was covered with oak forests. The tall round tower on the left was the first stone structure built on the Rock after the Church took over in 1101. The shape of these towers is unique to Ireland. Towers like this were primarily used as bell towers and lookout posts. This one stands 92 feet tall with walls over 3 feet thick. The tower's stability is impressive when you consider its age, the winds it has endured, and the shallowness of its foundation (only five feet under present ground level!). The graveyard on the Rock of Cashel still takes in the deceased, but only those put on a waiting list by their ancestors in 1930. A handful of those chosen few are still alive and once they've passed, the graveyard will be considered full. 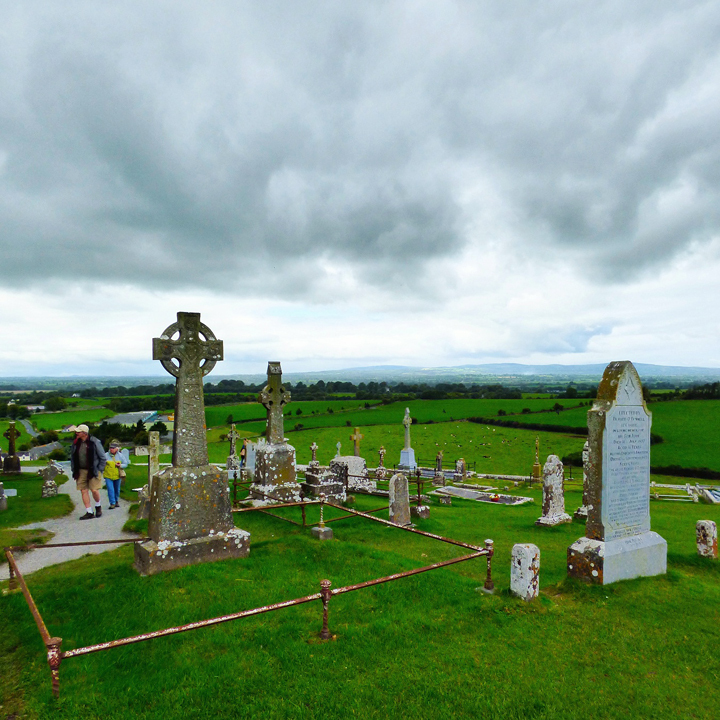 The graveyard, round tower, and cathedral on the Rock of Cashel. The large cathedral that now dominates the site was built largely between 1230 and 1290. The church's pointed arches and high narrow windows proclaim the Gothic style of the period. Remnants of 15th century frescoes remain. These were rediscovered during renovations in 2005. They're as patchy and hard to make out (and just as rare for Ireland) as the century-older Frescoes in the chapel. Back outside, we admired this huge chunk of castle wall debris. This end of the cathedral was converted into an archbishop's castle in the 1400s. In 1848, a massive storm known as the "Night of the Big Wind" in Irish lore, flung the huge chunk down from the ruins above. Hopefully no one was standing there. Cool coat of arms. | The original St. Patrick's Cross. Outside is a replica of St. Patrick's Cross. 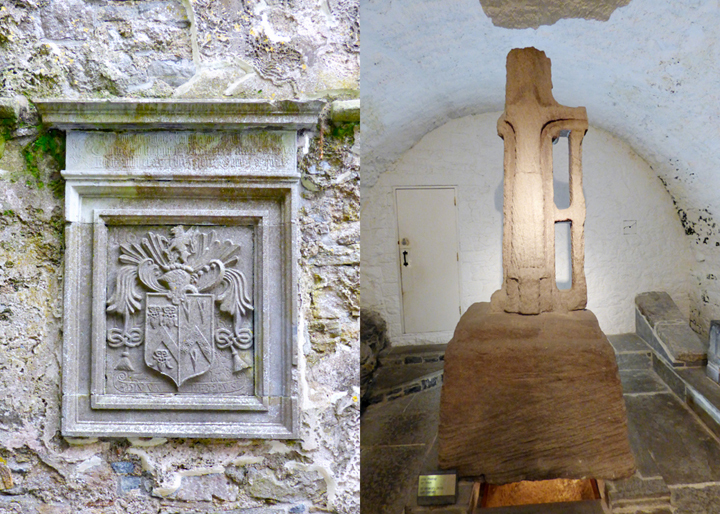 The 12th century cross, a stub of its former glory, was carved to celebrate the handing over of the Rock of Cashel to the church 650 years after St. Patrick visited the area and baptized King Aengus at the Rock. Typical Irish crosses use a ring around the cross' head to support its arms and to symbolize the sun (making Christianity more appealing to sun worshipping Celts). But, instead, this cross uses the Latin design: the weight of the arms is supported by two vertical beams on each side of the main shaft, representing the two criminals who were crucified beside Christ. Today, only one of those supports remains. 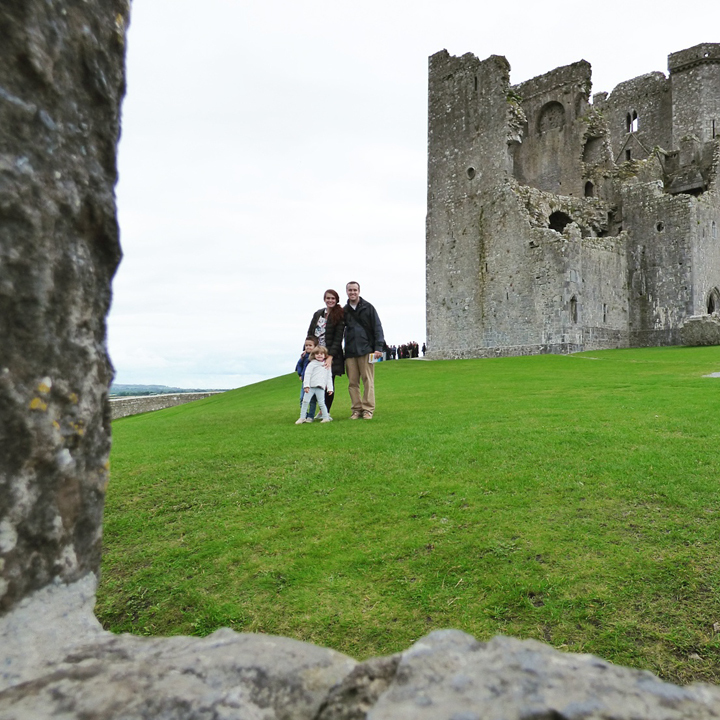 Our family at the Rock of Cashel on Friday September 18th 2015. Next recap is of the colorful city of Cobh! This was one of my favorite stops in Ireland. Thanks for posting - so many memories. Paige your posts are so full of information, just so many details. I learn so much from your adventures, I'm always so intrigued. When you're out site seeing, are you writing things down. I mean how do you know all the details when you get home to post here? Its just amazing. When I'm out visiting and I finally check my camera half the time I don't even know what I took picture of, lol. Thank you for sharing. That was a cool stop! Thanks again for sharing this amazing tour to Rock of Cashel! What a cool place that is full of history.